It’s been a busy couple of weeks for me. Although we paid a visit to Rocket Frog Brewing during their grand opening a week ago, I’m only getting to write about it now. There’s a bit of geek whimsy behind the name and a notably high percentage of good beer to go along with it. On September 12, 2013, NASA launched the Lunar Atmosphere and Dust Environment Explorer mission from the Wallops Island Flight Facility, a lesser-known launch site on the Atlantic coast of Virginia’s Delmarva peninsula. Wallops launches smaller rockets mainly headed to sub-orbital and low Earth orbit, but this mission went all the way to the moon. The remarkable thing about it for our beer excursion is an image captured by a facility camera just as the rocket ignited. Wallops Island Flight Facility sits adjacent to the Wallops Island National Wildlife Refuge, home to many small critters. A frog ventured out to the Flight Facility and was caught in a camera’s eye at ignition. (Photo at left courtesy of Rocket Frog Brewing). That photo became an internet sensation shortly after it was made public. Rocket Frog Brewing was a gleam in the eye of its owners back then. 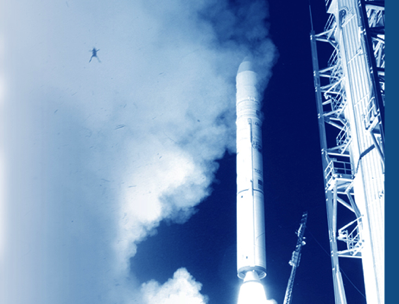 The rocket-startled frog stuck with them and, with mission contractor Orbital Sciences Corporation based only a couple of miles from their future brewery, became a mascot. Although we didn’t get to meet the owners, I wonder if there’s also an employment relationship there for at least one of them. The brewery and taproom sit in an office park in Sterling. The taproom bears a series of long, narrow, high tables accompanied by metal stools. An L-shaped bar is at the back, and a shallow table attached to the side wall permits standing while sampling. A couple of low tables seating six or eight are up front, and bathrooms are to the right. Televisions are mounted up high around the room. Beer-making vessels are visible through a glass wall at the back of the room. A food truck was on-site for the afternoon, parked directly in front of the taproom entrance. We sampled eight beers at the very crowded grand opening, luckily scoring an open pair of seats across from one another. Rocket Frog did pretty well by me, scoring four or more stars for half of their beers on Untappd. It often takes experienced brewmasters a few batches to dial in their recipes just so. Realize that beer recipes are the property of the brewery owners, not the brewmaster, so that moving to a new brewery often requires the brewmaster to start from scratch. One who hits it right on multiple products right away is a good find. Rocket Frog’s eight offerings are based on five actual beers, two of which are modified with flavoring ingredients. 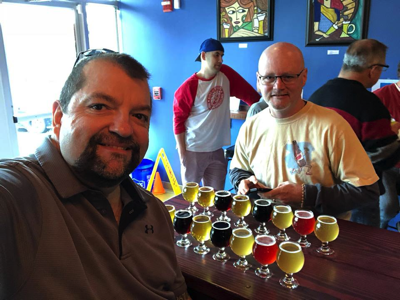 Their Wallops Island brown ale is twinned by a coffee brown ale incorporating coffee beans late in the beer-making process, while their saison is tripled by adding peaches to a batch and raspberries to another. I’m a fan of the saison (farmhouse ale) style, and Rocket Frog’s Croak at the Moon didn’t disappoint. Its yeasty if somewhat astringent simplicity garnered an above-average 3.5 stars. The fruited versions scored a little lower, although I did give a point each for the brewmaster’s skillful blend of fruit with a traditionally yeasty beer without the result tasting like cough syrup. Well done for what it was; I’m just not keen on most fruited beer. Of note, Angry Alice IPA and Angry, Angry Alice DIPA were very good, earning at least four stars each. Even better, we met Alice, the young girl for whom these beers are named. She wasn’t angry this afternoon, just a wee shy. Probably a little overwhelmed by the crowd, too. The DIPA version of Alice garnered four and a quarter stars on my Modified Emerald Protocol scale. Any beer that pushes me to rate outside whole numbers has a measure of nuance requiring a more granular scoring. Angry, Angry Alice was one such product. Its blend of hops resulted in a piney, resinous flavor that gave way to a lingering maltiness. A DIPA is higher in alcohol by volume (ABV); a good one hides it amid complex hops flavor, while an excellent one blends in a solid malt backbone. Angry, Angry Alice did both. Kudos. Minotaur V blonde ale, named for the rocket that boosted the LADEE mission into space and the frog into the air, was a standout worthy of four stars. Blonde ales are more often than not a disappointment on my palate, neither particularly flavorful nor nuanced with complexity. They’re often created as entry-level beers agreeable to a broader audience and enjoyable by the non-beer fan side of the party. Rocket Frog’s Minotaur V blonde balanced a moderate hops load with a malt bill that lingered on my palate well after swallowed. This tasting session, while not out of place among our beer excursions, garnered attention from a few other attendees. Our array of eight samplers each lined up in parallel appeared remarkable. (Photo at right courtesy of Neal Emerald.) Although these folks looked to be beer fans themselves (who should know better), our eights must have looked like a lot of beer. Do the math: eight five-ounce samples is forty ounces, or two-and-a-half pints. Enjoyed over a couple of hours amid note-taking and discussions of the beer, movies, and upcoming travel, that’s not a great deal of drinking. Perhaps it was only the colorful array of multi-hued beverages that caught people’s attention. 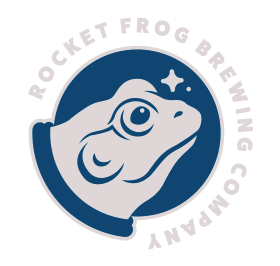 Rocket Frog provides an enjoyable visit filled with tasty beer. Begin with the Minotaur V blonde and, if you’re a real beer fan, be sure to try both Alices back-to-back. Save the fruited saisons for last, as their flavoring will skew your palate a bit but leave you with a pleasant lingering taste to remember.